I’ve saved this all year for today. This was going to be my Christmas Day beer so had to be good. I bought it from the Watermill inn up in the lake districts. Shows I do have some will power to not open it before. Anyway, pours quite dark, chocolatey. Head was quick to vanish. Little or no aroma really. Tastes pretty smooth and a bit thick, almost treacly. I get a bit of Christmas spice from it, probably cinnamon and orange. Nice. Would be nice in front of a roaring fire on a cold wet night. Yummy. 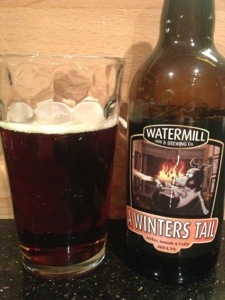 This entry was posted in beers and tagged watermill, winter. Bookmark the permalink.